I recently stumbled across a new blog that I immediately loved. 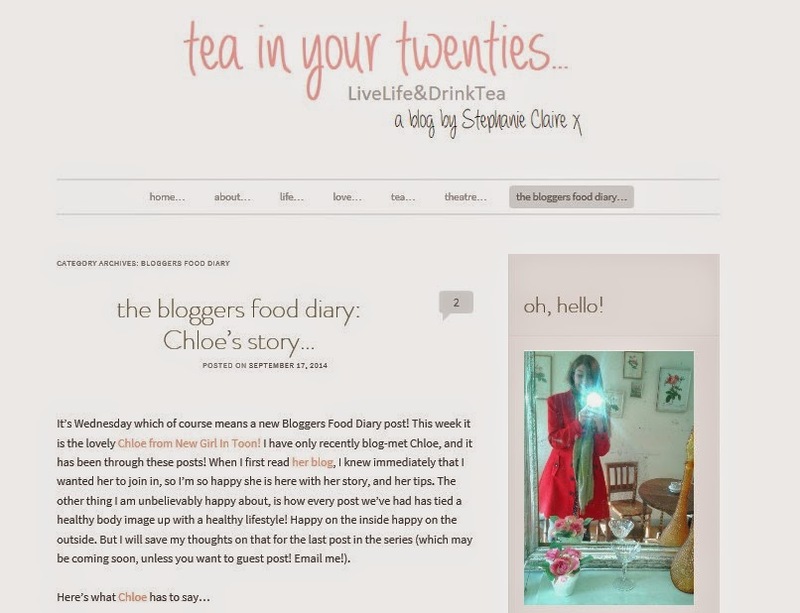 Tea in your Twenties is written by Stephanie Claire who is my kind of girl (she works in theatre and loves drinking tea ... AMAZING!) Her blog is stuffed full of great content and she has also started a series called The Blogger's Food Diary where every Wednesday guest writers share their experiences of a subject that is very close to my heart - healthy eating and body image. I was so happy when Stephanie Claire asked me to share my story ... so to read about how I dealt with my 9 stone weight loss and my tips for journeying from obese to healthy and maintaining a healthy lifestyle whilst enjoying cake please take a look here. You can also read my whole weight loss story on my blog here. If you have any healthy lifestyle stories to share I'd love to hear about them! Even more difficult now I write a blog that seems to involve me eating large amounts of cake every week :) I definitely have to work even harder to stay slim now! Sounds like an absolutely fabulous blog - I'll make sure I take a good look.